Modern Britain is run by a left-leaning, liberal establishment of civil servants, lawyers and journalists. ‘The establishment’ once conjured up an image of white, pin-striped and wrinkly men sat in smoky London clubs discussing the governance of Britain. 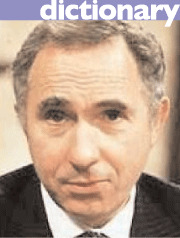 Yes Minister’s Sir Humphrey Appleby (pictured) would have been an archetypal member of that old establishment. The old establishment has largely passed away, however, and has been replaced by new powers that are neither ‘C’onservative nor ‘c’onservative. Within that list only two – business and the armed forces – are reasonably reliable ‘forces of conservatism’. The arts establishment, organised labour, the civil service and quango-land are firmly in the left, liberal camp. The legal and voluntary sector establishments are quickly sliding into that same camp. Religious elites are fairly liberal but popular evangelical and orthodox grassroots movements are fairly conservative. The liberal left have almost completed Antonio Gramsci’s ‘long march through the institutions’ and they have won the vast majority of the establishment for their worldview. Only the building of a new conservative infrastructure offers a hope that today's establishment can be overthrown.